Creditors violating an individual’s bankruptcy protection, unfortunately, is not uncommon. In some cases, it is a mistake caused by ignorance of the bankruptcy laws, mailing notice to creditors using an incorrect address, or poor internal administrative tracking by the creditor. In other cases it is the result of extreme negligence on the part of the creditor. In a few egregious cases… it is intentional. It is important to understand what protections a creditor is violating by attempting to collect a debt after you file bankruptcy. When you file bankruptcy a temporary “Automatic Stay” immediately goes into place. The “stay” is a court order that halts all collections activities designated in the Bankruptcy Code. You are required to notify all creditors. Until actual notice occurs, it is unlikely any creditor would be faulted by the court for continued collection activity. For this reason it is very important not rely solely on the court’s notification in cases where garnishments, foreclosure, levies and liens are imminent. In the event of unwitting continued collections after the filing of the case the Automatic Stay will void or make the action invalid. The Automatic Stay protection last from the beginning of your case, the filing, to the end of your case, the discharge. So what is the difference between the Automatic Stay and Discharge protections? During the time your case is active you have not received the court’s confirmation that you qualify for relief or elimination of your debt. The confirmation that you qualify for permanent relief from the debt is the “discharge” you receive at the end of the case. The penalty for violating your bankruptcy discharge is primarily a monetary sanction. There is a certain tolerance for mistakes in bankruptcy court due to the fallibility of human communications. For this reason, it is not wise to jump and file a Motion for Sanctions based on one violation. Since there is a cost in terms of attorney’s fees, time, and possibly filing fees to pursue a violation of your bankruptcy protections, the more evidence of the egregious nature of the communication the greater the chance you will recover these costs from the creditor. Therefore, being patient and documenting the repeat nature of the creditor’s violation is important. In the few situations where the violations of a person’s bankruptcy protection appears to be intentional there are some reoccurring common denominators. The first common denominator is a who made the mistake of filing a bankruptcy without an attorney has a greater risk of continued creditor harassment. There are two reasons this is true. The first is that the person not using an attorney is less likely to properly notify all of the parties necessary. The second reason is that creditors that are inclined to intentionally violate bankruptcy protection know a person who choose not to use an attorney due to ignorance, cost, or bad advice, is less likely to use an attorney to protect their rights against violators. The second common denominator is that the creditor is more than likely to be a high-risk lender such as an online payday lender. The final common denominator is that there is a high likelihood the creditor collecting did not extend the loan in question. In other words, it is more common for such violations to come from collection agents or companies that have bought or been assigned the debt. In a situation where the violation is more a result of bureaucratic incompetence, the lack of immediate correction is usually the result of the systemic organizational inability to deal with the information or make the proper corrective action. While it is often difficult to prove the “intent” of an organization, it is sufficient to prove that the lack of corrective action was egregious in order to recover some damages or sanctions. What to do if your bankruptcy protection is being violated depends on whether it is during your bankruptcy (Automatic Stay violation) or after your bankruptcy is completed (violation of your bankruptcy Discharge). Make sure the creditor is listed along with the correct address, collection agencies, and attorneys representing the creditor. Provide your case number to the caller and the name of your attorney and confirm the correct mailing address for the creditor. Send via certified mail, signature requested, a copy of the Notice of Bankruptcy Commencement or your Notice of Bankruptcy Discharge. Name, company, phone number, date and time, and gist of the communication with the caller. Retain copies of all mail, e-mail, letters, or other written communications from the creditor. Send all request to inform the creditor of your bankruptcy and to discontinue communications via certified mail signature requested. You must file the Motion For Sanctions within approximately 90 days of the filing of the case or before the case closes. Have a minimum of four to five examples of the creditor’s violation over a period of 60 to 120 days. Show at a minimum three documented attempts to notify the creditor of your bankruptcy and the discharge. 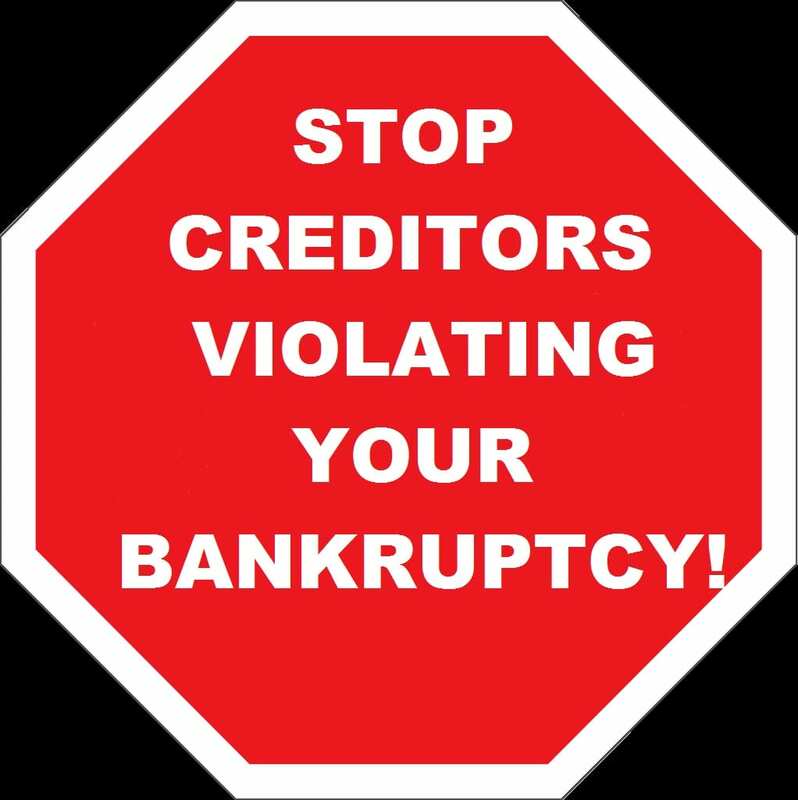 If you are pursuing a violation of your bankruptcy protection, use an attorney. The process of filing a Motion for Sanctions, related court pleadings, and the trial to recover damages is complex and complicated. Call The Merna Law Group at 800–662-8813 for assistance. If you found this article useful I would appreciate it if you would Google+1 it at the top of the page so others can find it more easily.